Casseroles have come a long way and seem to get more creative and more delicious as time goes on. 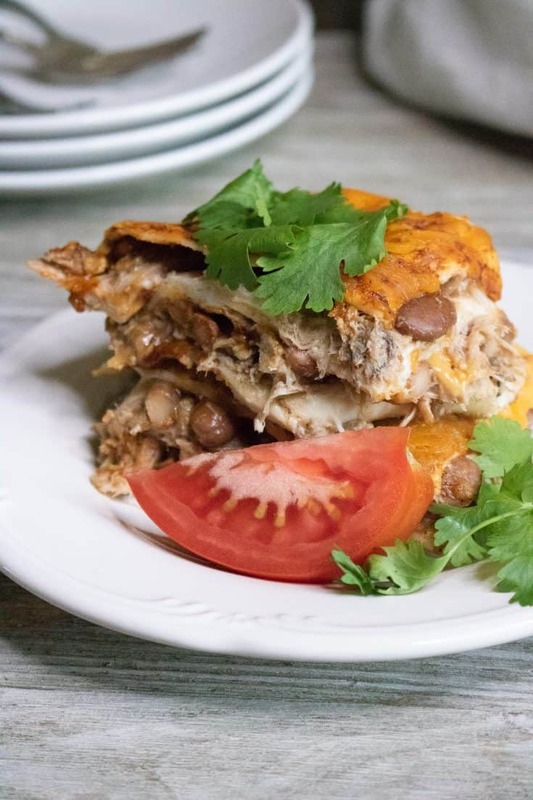 And this amazing Pork Enchilada Casserole is no exception.It it the ultimate comfort food plus it is a great way to satisfy your Mexican food craving. And all in one meal! You and your family are sure to love this satisfying, flavorful dish. 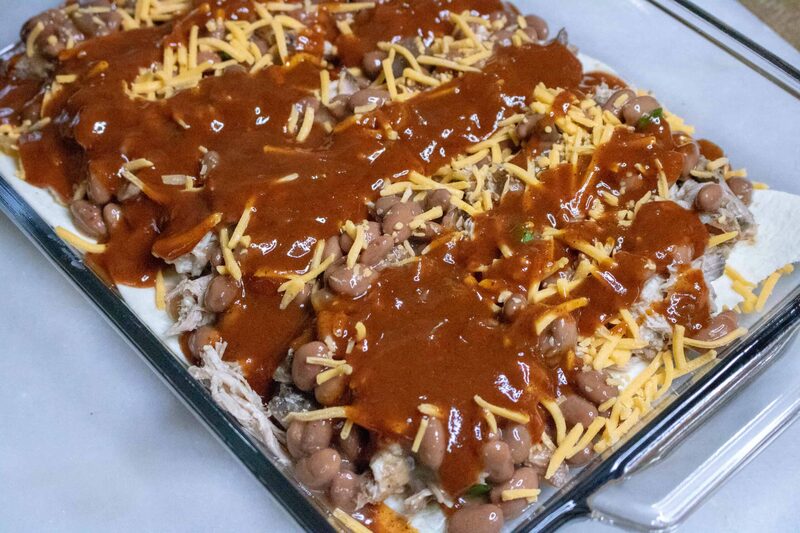 This casserole looks like you slaved away in the kitchen for hours, but truthfully? It is very simple to make. Add a few ingredients together to make the enchilada sauce. 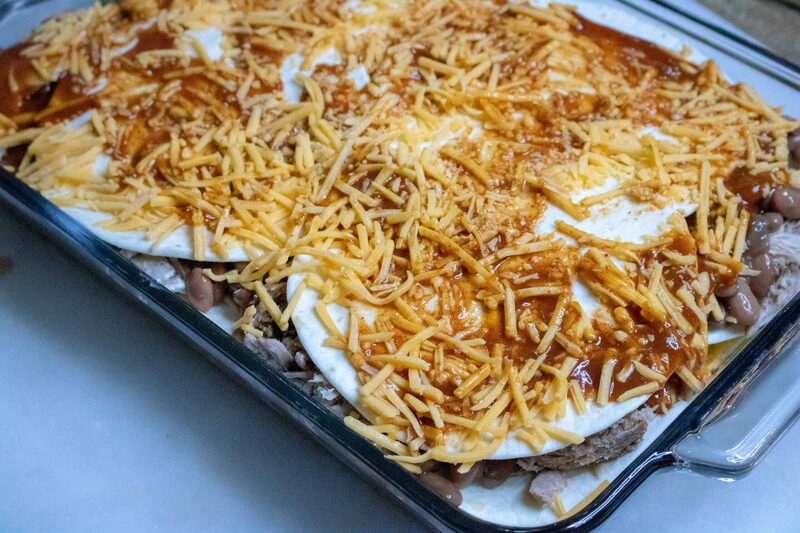 And then it is simply a matter of layering sauce, tortillas, shredded pork with pinto beans, cheese and sauce and then starting the layering over again. So simple! 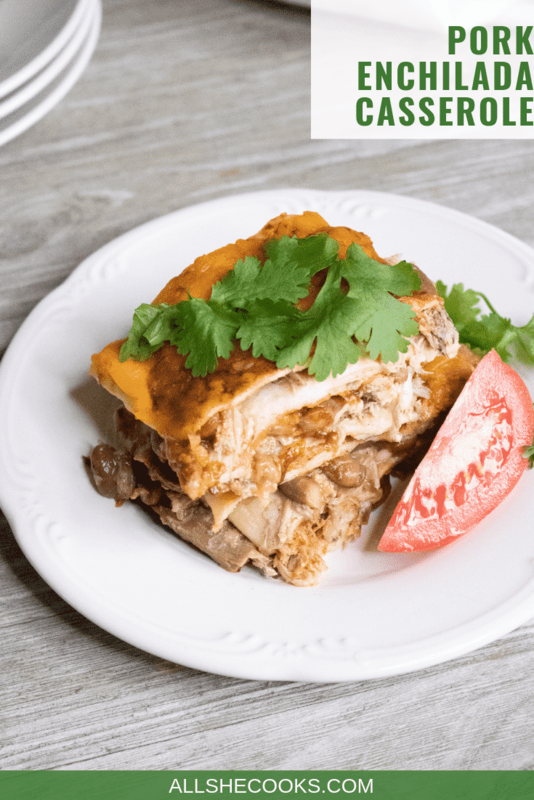 Pork Enchilada Casserole makes plenty, which means it is the perfect meal for a large family or for bringing to a potluck. And if you’re not feeding a crowd, you get the benefit of having delicious leftovers, which can be used for quick and easy lunches or dinners through out the week. Shredded pork has so much flavor and is fun to use instead of the usual ground beef. It’s always fun to switch things up a bit. I recommend making this awesome Slow Cooker Pulled Pork. 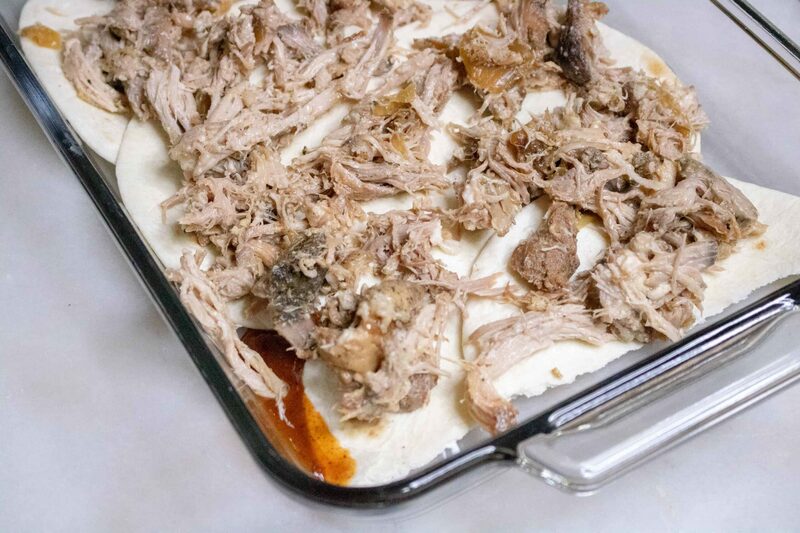 It is perfect for using in this Pork Enchilada Casserole recipe. Step #2: Heat vegetable oil over medium-low in small saucepan. Step #3: Add in flour and chili powder and stir for a couple of minutes. Step #4: Then add in tomato sauce, water and spices and cook for 10-12 minutes or until it reaches a thick sauce consistency. 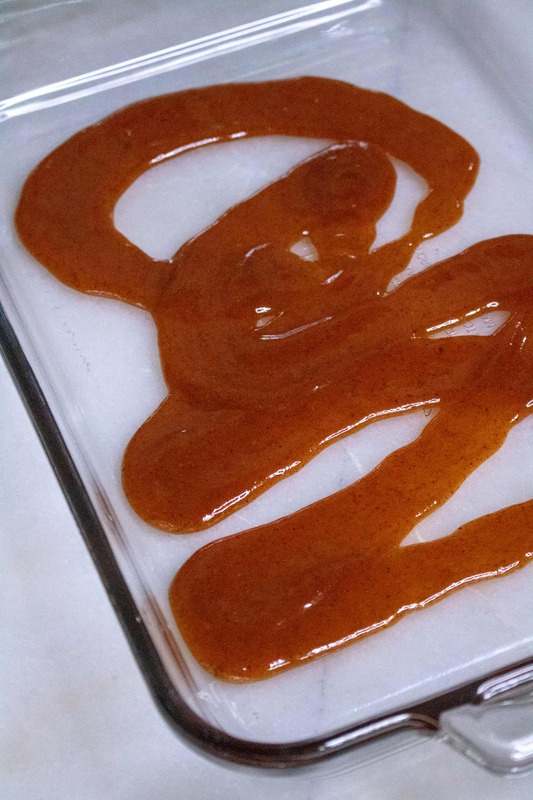 Step #5: Spoon some enchilada sauce into the bottom of a 13×9 pan. Step #6: Add a layer of flour tortillas on to bottom of the pan. Step #7: Next, top with a half of the pork and half of the pinto beans. Step #8: Sprinkle 1/3 of the cheese on top of that and then add 1/3 of the enchilada sauce. 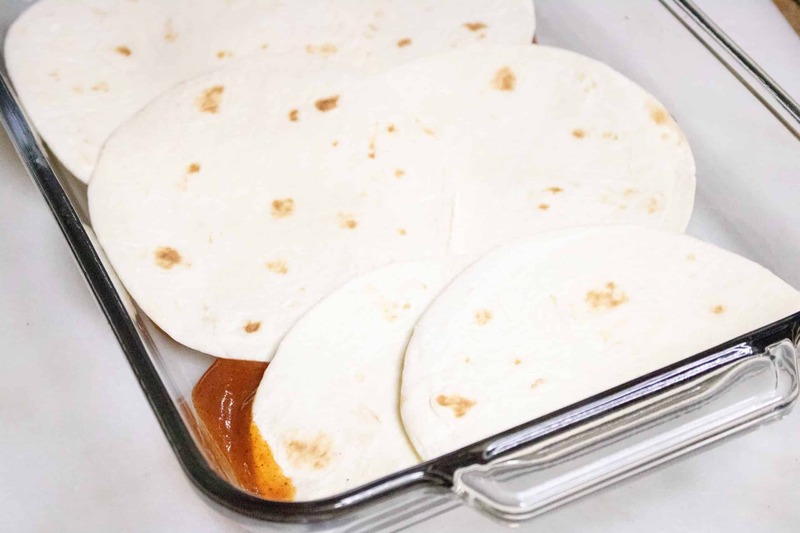 Step #9: Add a second layer, and then top that with flour tortillas, enchilada sauce and cheese. Step #10: Bake for 30 minutes or until bubbly. Be sure to check out this awesome, simple recipe for Slow Cooker Pulled Pork to provide delicious pork for this recipe. Maybe you have someone in your family like I do that loves bread with their dinner. Every. Single. Night. If so, this Mexican Corn Bread would be a yummy and obvious choice. Or maybe you have someone who is just not as fond of pork as they are of chicken but really, really wants something with Mexican flare. Then why not try this equally delicious and easy Mexican Slow Cooker Chicken? 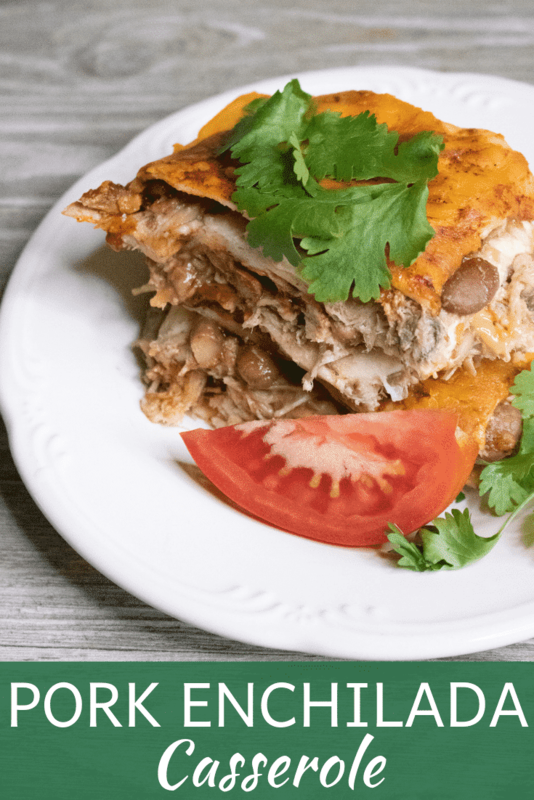 This Pork Enchilada Casserole is a satisfying, flavorful, comfort food meal. Heat vegetable oil over medium-low in small saucepan. Add in flour and chili powder and stir for a couple of minutes. Add in tomato sauce, water and spices and cook for 10-12 minutes or until it reaches a thick sauce consistency. Spoon some enchilada sauce into the bottom of a 13x9 pan. Add a layer of flour tortillas on to bottom of the pan. Top with a half of the pork and half of the pinto beans. Sprinkle 1/3 of the cheese on top of that, and add on 1/3 of the enchilada sauce. Add a second layer, and then top that with flour tortillas, enchilada sauce and cheese.